Los Angeles area ladies, mark you calendars. 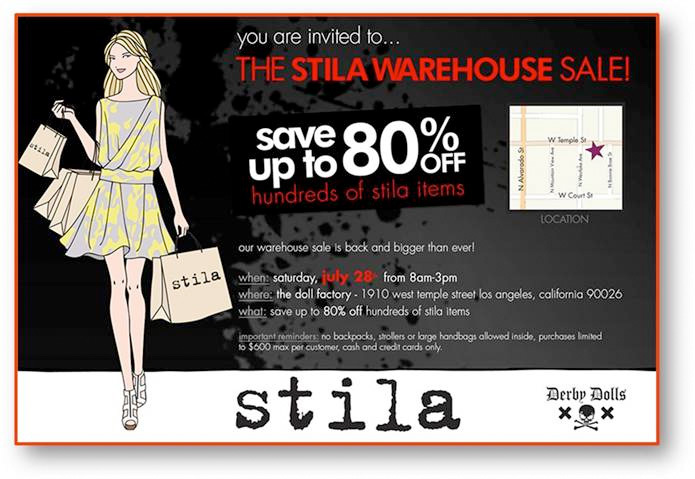 The annual stila Warehouse sale is scheduled and you want to be there to score up to 80% off hundreds of stila items. This summer’s sale is taking place on Saturday, July 28th at The Doll Factory in LA. All the important info is in the official invite below! Bid on a Best of Beauty Suitcase. In support of Cancer and Careers, Allure Magazine has put together over 125 beauty products in what they are calling a Best of Beauty suitcase that is being auctioned off on ebay. These products include great beauty classics, cult favorites, new launches, and past award winners - and is worth close to $3,500! 100% of the purchase goes towards providing resources - like online career coaching, support groups and interactive resources - for the brave individuals who manage cancer in the workplace every day. Bidding starts at $500 and the auction closes on February 7, 2012. Click here to see all the products and bid now.